The team from Zodiac were also very insistent that these mock ups had to be of the very highest quality – and durable enough to survive the world’s biggest event of its kind without showing signs of wear or damage by the end. They had, had a few bad experiences in the past and told horror stories of less than perfect seat mock ups being pulled off of the stand at the last moment – something they were obviously keen to avoid. A joint and combined effort was the only option. Zodiac and Amalgam worked closely throughout to coordinate their CAD resources, in-house and outsourced CNC machining, 3D printing, specialist upholsters and several couriers with military precision. 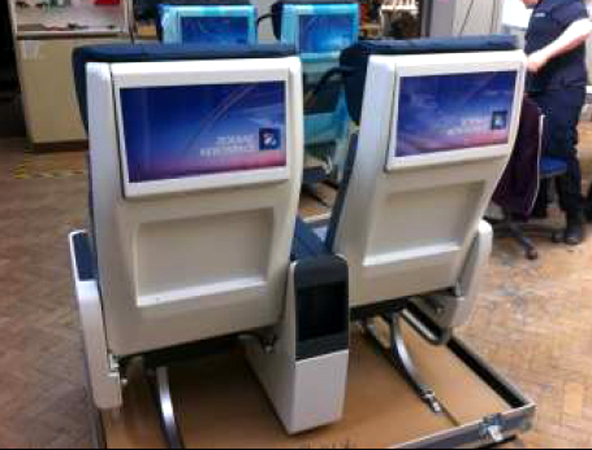 Full size mock ups of aircraft seats are some of the larger models we get asked to produce at Amalgam. They are also some of the most complex working models relying, as they do, on a range of materials, methods and techniques coming together perfectly to complete a fully functional and totally realistic prototype with the added factor of being able to withstand the rigours of being sat upon, pulled, pushed and abused by trade show visitors. Recently we were approached by Zodiac Seats UK, a world leader in First and Business Class aircraft seats. They had a requirement for full size mock ups of their new Z500 and Z600 seats for AIX Hamburg 2015, the leading aircraft interiors event, attended by 500+ leading aircraft interiors suppliers and around 14,000 visitors. The only problem was that the designs were still “In progress” and there was only around six weeks to the show. Just to add to the pressure, Easter would cut into the build time as well! 3d printing, CNC machining & lots of skill & know-how all combine to produce these full size mock-up seats. 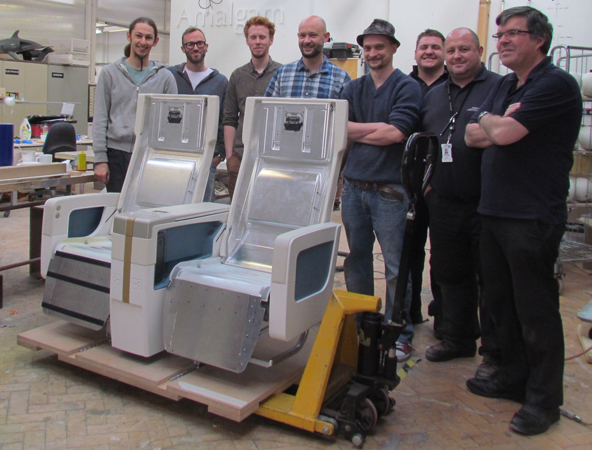 A proud team around the last full size mock-up seat. 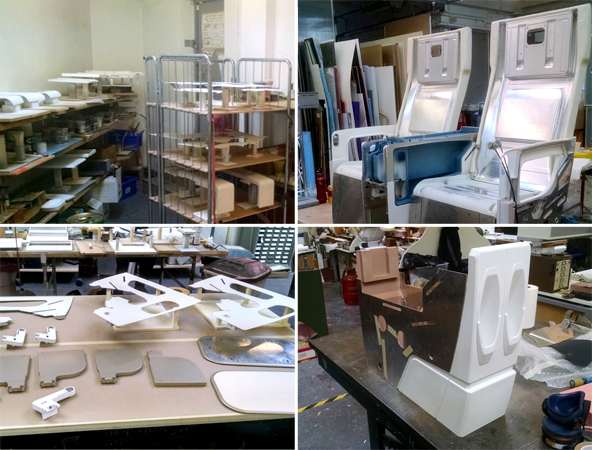 Literally hundreds of components were finalised, produced, finished and assembled in record time at Amalgam’s workshop. The pictures in this article can give only a small taste of the complexity of the task and the team held their breath as the completed seats were finally inspected by Zodiac’s senior management. Happily everyone was satisfied with the results of our efforts and the seats were dispatched, in the nick of time to be installed on Zodiac’s stand at AIX 2015, where the shots of the completed seats shown in the slide show above were taken. Amalgam has over thirty years experience, an in-house team of designers, makers and engineers plus a wide range of contacts and specialist suppliers enabling us to rise to pretty much any challenge. From the smallest component part to complete exhibitions, our team are ready and waiting to provide whatever your particular project needs. Full size mock ups are only a small part of what we can do, take a look at some of our wide range of work here. Z 500 full size mock ups – ready for dispatch.